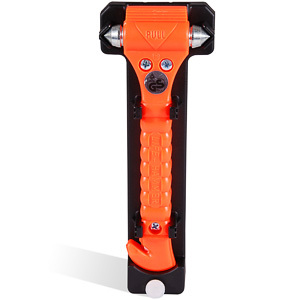 The Lifehammer was developed as the one and only original car safety hammer around 30 years ago and has been the standard lifehammer for vehicle manufacturers in Europe, where some countries stipulate it as a legal requirement, and around the world ever since. With the original model now known as the Lifehammer Classic, two new models have recently been developed and won design awards. 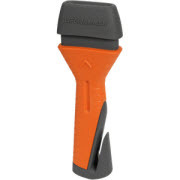 These are the Lifehammer Plus with it's new conical non-slip handle and the Lifehammer Evolution which, by just pressing against the car's side window, an ultra-hard ceramic hammerhead will come out, shatter the window and reload automatically. Even the holder has been re-designed on the new models so that it can easily clip onto a door pocket to keep it close to hand. Double glazing at home is even harder to crack so, the excellent Lifeaxe, which was designed to break windows in train carriages, is the product to use. 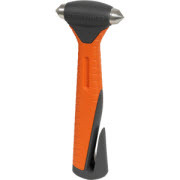 Heavier than vehicle hammers and with 5 strike heads, this easily breaks double glazed windows and, with a large finger guard, it's safe, too.